Fitness instructors and health club owners are in the business of selling themselves and their knowledge. Continuing education by attending conventions, conferences and workshops help instructors broaden their horizons and expand their wealth of knowledge about safe and effective exercise equipment and practices. Held at different times during the year in Colorado Springs, Atlantic City and Cape Cod, these conferences provide professionals with the AAAI/ISMA, ACE, AFAA, AEA, and IFTA credits needed for renewal. At the conference, the practical and theoretical knowledge is shared. AAAI/ISMA certifications are approved by many major gym chains throughout the United States. There are more than 180,000 certified members globally. The American College of Sports Medicine (ACSM) hosts this Summit and Expo that provides personal trainers, certified professionals, and even students with insight on everything from scientific to practical application. Speakers include experts in the field, including Len Kravitz, Bess Marcus, and many others. Held in Orlando, Florida, this conference allows thousands of fitness professionals from across the United States, Canada and 20 other countries to network as they take a look at the newest products and services for their programs or facilities. More than 250 manufactures and suppliers with a variety of athletic equipment showcase their products to keep professionals up to date with all that is available. More than a quarter century later, the trend continues and the DCAC fitness seminars offer continuing education credits through: AAAI, AEA, ACE, AFAA, NASM, NETA and NSCA. This health and fitness expo in Phoenix is now in its 19th year. 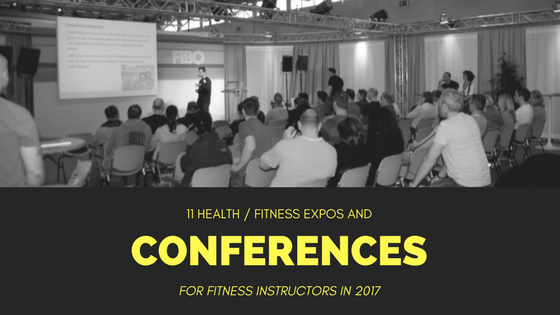 The event pulls together some of the top experts in the field who speak and present health research and fitness seminars. There are workshops on everything from core training to Pilates, as well as interactive outdoor activities in Phoenix, and a pool party! Held in Amsterdam, this is Europe’s biggest conference for movement professionals. Topics include nutrition, crossfit, functional training, strength and conditioning, and more. Many professionals from the United States, United Kingdom, Finland, Germany, and the Netherlands present. Sessions cover three days. What happens at this convention in Vegas can be shared with clients afterwards. More than 225 industry experts present on health, fitness, and nutrition. There are more than 330 in-depth and hands-on workshops, lectures, and workouts. Fitness professionals can increase their depth of knowledge and learn ways to increase success and income. The IHRSA annual international convention and trade show is held in Los Angeles. For more than 30 years, this convention by the International Health, Racquet & Sportsclub Association has attracted attendees from more than 80 countries. It features presentations from leaders in the fitness industry, an educational component, and premier trade show showcasing the latest products in health and fitness industry trends. Attendees have many topics to choose from. There are as many as 17 sessions on a variety of topics every hour, led by world-renowned fitness educators.